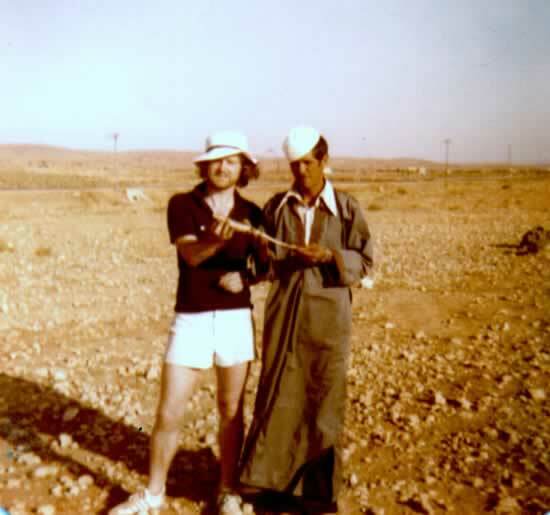 Due to the earthquake in Yugoslavia in 1979 we looked to continue work on chelonians in Morocco during 1980 and 1981. Kenny Humpleby again assisted with the field work. At the time there was conflict between the Moroccan Government and the Polisario Front over control of Western Sahara Province and we were stopped by government troops and denied access to potentially useful areas. However, we were able to access most of our main study area in the arid region. The problem did not affect the coastal areas where we examined the thermal biology of a small lizard Saurodactylus brosseti and spur-thighed tortoise Testudo graeca near the town of Agadir. In the arid region we researched population ecology and thermal biology of Mauremys (= caspica) leprosa and thermal ecology of two anurans at an irrigation channel (funding from the British Ecological Society for the work on Mauremys). A good book on North African reptiles and amphibians, including information on climate and general ecology is 'Amphibians and Reptiles of North Africa' by Schleich, Kastle & Kabisch (Koeltz Scientific Publishers, Koenigstein, Germany). We frequently stopped at the area shown in the photo to look for Berber skinks (Eumeces schniederii). This is an impressive lizard adapted for dry environments and was common where clusters of Euphorbia echinus were growing. Body temperatures ranged from 20˚C in the morning to 30˚C in late afternoon. Somewhat odd was the frequent appearance of some Arab chap out of nowhere. The upper photograph shows the first such person but a different one appeared each evening. There were no obvious dwellings around, so exactly where they lived or came from remained a mystery. This photograph was taken on the road from Agadir to Tiznit. 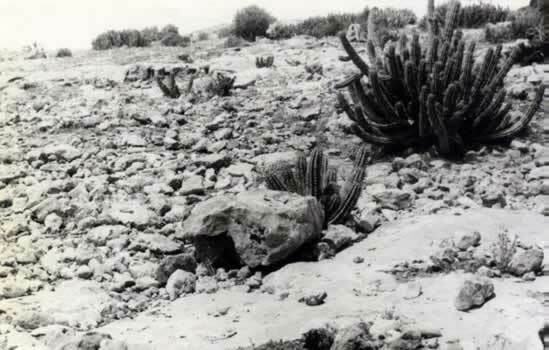 A view of the study area in the arid region for research on Mauremys leprosa, Bufo mauritanicus and Rana (= saharica?) perezi (see below). 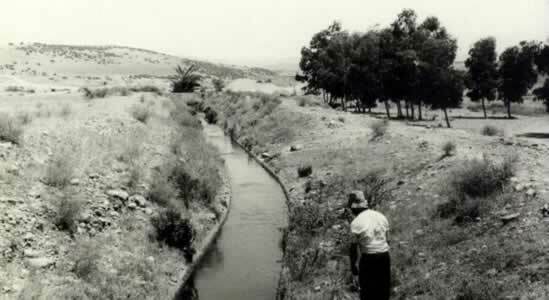 The irrigation channel originated from a large water dam with species of Eucalyptus providing the only shade. 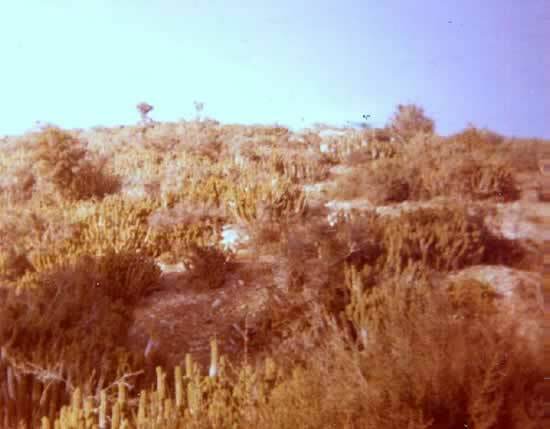 Growing on the hills in the background are clusters of Euphorbia echinus and various other dry adapted plants. Water temperatures varied from around 24 – 28˚C but sand temperatures often reached 55˚C. 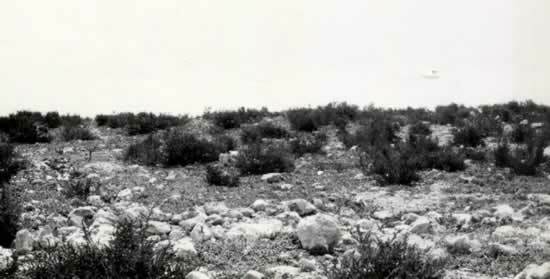 The photograph looks east and shows Kenny Humpleby on the lookout for specimens. 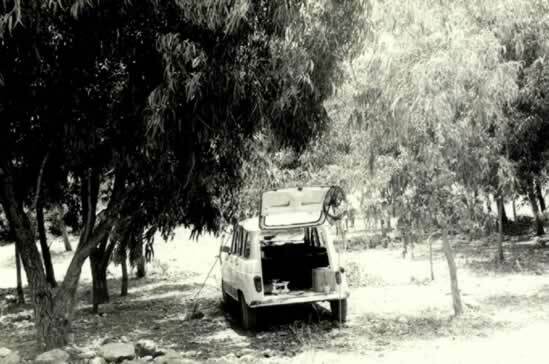 Transport between study sites and our base in Agadir was by Renault 4 (no fancy 4x4s for us! )rented from local Arabs in Agadir. Parking under the Eucalyptus trees was obligatory! 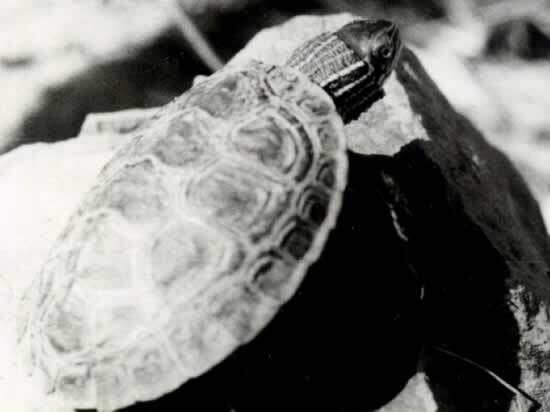 Swamp terrapin, Mauremys leprosa. We gathered data on thermal and population ecology in both spring and late summer. Interestingly, during spring animals were scarce in the irrigation channel but abundant later in the year. This perhaps suggests movement after the spring breeding period for foraging. Most animals were adults with some estimated to be aged 26 years or more. The largest animals were females (up to 680g). Algal growth was found on several specimens and apparently causes shell damage and is the feature that gives this species its zoological name ` leprosa`. Little basking was observed, probably due to the high water temperatures and hence at our study site they largely thermoconformed. In other areas, however, basking behaviour may be extensive but this must be dependent on water temperatures (pdf 16). 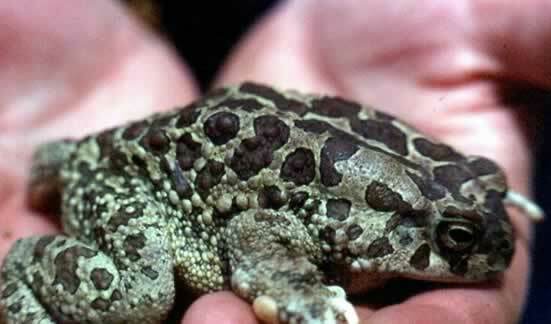 Mauritian toad, Bufo mauritanicus. This species was found living around a small pond near the irrigation channel. They were active terrestrially despite the heat (although with water available) and low humidity in some parts of the habitat. 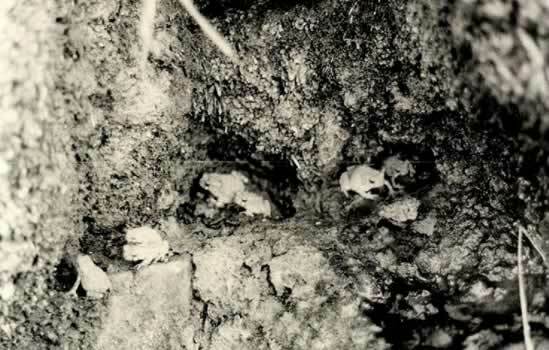 Some animals were found in shaded localities during daytime, for instance in crevices in rocks and damp areas near water wells (lower photograph) but others were active in full sun with body temperatures up to 33˚C. Evaporative losses in amphibians contribute to temperature control and hence activity and basking in hot regions is possible in the presence of water. Water frog, Rana perezi (above). This was common at the irrigation channel where it basked extensively despite the heat and high substrate temperatures. There were three body patterns, the one shown here is the speckled variety but the most frequent was a vertebral stripe. In arid areas it occurs almost exclusively in made-made reservoirs and irrigation channels and frequently alongside Mauremys leprosa. Large numbers of beetles (Tenebrio sp) appeared after sunset and may be a major food source, as indicated for Bufo mauritanicus by Schleich and his colleagues. Predators are probably terrapins and the viperine snake (Natrix maura). The taxonomy is complicated. Karyological studies suggest some populations, for example those found in the Sahara, are distinct and have been assigned to Rana saharica. Information on body temperatures is here (pdf 15). Body temperatures of reptiles and amphibians living in the same environment illustrated by the above graphs of body temperature frequencies (in percent). The two upper graphs shows body temperatures recorded from a gecko lizard (Tarentola mauritanicus) living under bridges and rocks near the irrigation channel and terrapin (M. caspica) living in the water channel. The lower graphs show body temperature distributions of amphibians; the toad (B. mauritanicus) was found in both open and shaded areas next to the irrigation channel, the frog (R. perezi) mostly basking on the banks of the channel. The behaviour of the terrapins indicated they were thermoconforming with body temperatures in good agreement with the temperatures of the water in the channel. The frogs controlled their body temperature by alternate periods of basking to heat up and entering the water to cool and rehydrate. Some basking was seen in the gecko, but in general they were inactive or moving in shaded areas (perhaps feeding) and so have a wide range of body temperatures. Presumably this was due to contact with a range of air and substrate temperatures. Limited basking was seen in the toad, and as in the gecko, they experienced a range of environmental temperatures and hence a broad range of body temperatures. Relative humidity varied from 76% in areas near water to 45% in exposed areas. These data give insight into how species explore thermal opportunities in different ways whilst avoiding critically high temperatures. 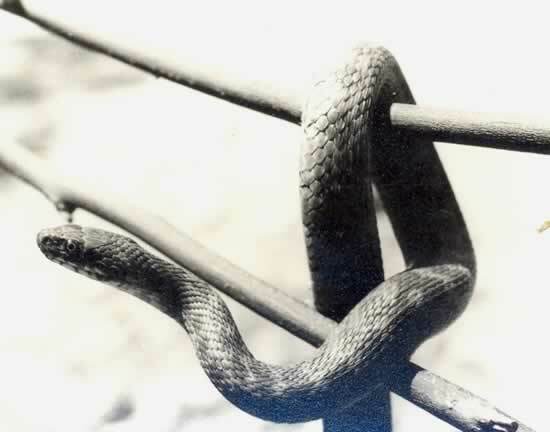 Viperine snake (Natrix maura). We occasionally came across this snake foraging in the irrigation channel presumably searching for amphibians (we saw no fish in the channel) particularly R. perezi. It was more frequently seen during May-June than September perhaps because size class frequencies of R. perezi were heavily skewed towards smaller frogs – and easier to capture? Research on this species in Spain by Adrian Hailey indicates that it is normally a sit-and-wait predator but our data suggest it may also forage. We never found any outside the channel presumably due to high substrate temperatures. A climatic feature of the coastal study locality during our study period was sea mists that drifted in from the Atlantic most evenings. This is shown in the top photograph. The mists usually did not lift until late morning and sometimes persisted into early afternoon and provide moisture for both plants and animals. One of the most common plants was the succulent Euphorbia echinus (middle and bottom photographs). This plant clusters in what are termed`Graras` some 300 - 1000m long, surrounded by bare dry ground. In the habitats shown we collected our data on tortoises (pdf 13) and lizards (pdf 60). 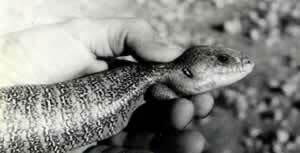 Lizard-toed gecko, Saurodactylus brosseti. 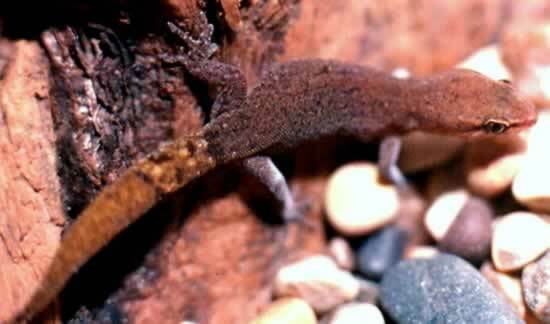 This is a small lizard with a snout to vent length of just over 30mm. We measured body temperatures and home site selection in the coastal area shown above. It lives under relatively large stones during the day venturing out in the evening to feed on small insects and spiders using both ambush and foraging. Apparently it lays just one egg. Spur-thighed tortoise, Testudo graeca. 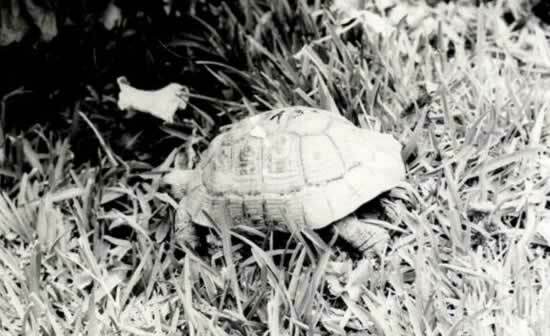 One of the species of tortoise imported in large numbers into Europe between the 1950s and 1980s. Mike Lambert had carried out extensive studies on its abundance and distribution in relation to climate. Our research was of limited duration and confined to thermoregulatory behaviour. The results showed that basking is the main early morning activity but may be extended into the afternoon in the presence of sea mists. Feeding does not take place until appropriate body temperatures are attained (30 – 35˚C). Lifespan has been known to exceed 116 years in captive animals. 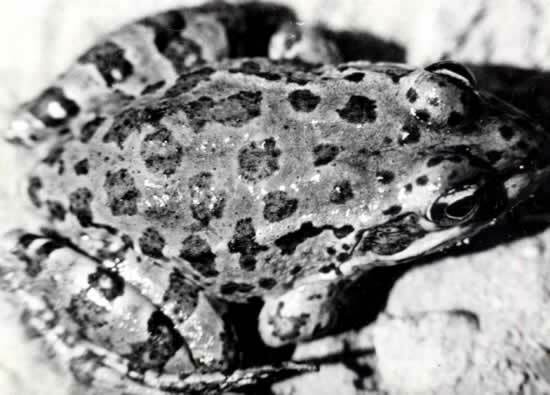 (1983) Body temperatures of two species of desert amphibians Rana perezi and Bufo mauritanicus. British Journal of Herpetology 6, 284 – 286. pdf 15. (1985) Observations on the amphibians and reptiles of southern Morocco (faunistic list). British Herpetological Society Bulletin 12, 28 –36.